Perfect Picture Book Friday – Extraordinary Endangered Animals PLUS The Contest Winners!!! Thanks to Joanna over at Miss Marple’s Musings, I realized in the nick of time that today’s Perfect Picture Book Friday coincides with the 8th Annual Endangered Species Day. So I have chosen a special book. I hope you will enjoy it. Brief Synopsis: The book begins with a brief overview of living in harmony with nature, biodiversity, which animals need protection, and how important any effort to help is, as well as a map of the world showing where you would find the animals listed in the book. (It really is brief – only about 4 pages.) This is followed by the main part of the book which details 34 species that are endangered (from Europe, Asia, North and South America, Africa, and Oceania). 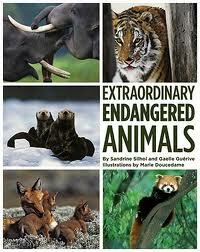 Links To Resources: The book itself is a resource, full of information on many endangered animals. It has a glossary in the back along with several sections on how you can help endangered animals. It could be used in conjunction with study of animals, the environment, science etc. Now. We have one other item on the agenda today. Usually I tease you for a while before I tell you what you want to know, but today I’m going to be very mature. I’m going to get right to the point. Without wasting a moment, I’m going to just come straight out and tell you that the Can’t Sleep Without Sheep Jingle Contest and the Can’t Sleep Without Sheep Kids’ Drawing Contest have both been clearly and decisively won. Shouldn’t you be off reading everyone’s picture book recommendations? You want to know WHO the winners are? Golly! You guys are sticklers for details! used sheep in their winning entries! under 12 and from the same family!!! That’s right! The popular vote has spoken, and the winner of the Can’t Sleep Without Sheep Jingle Contest is none other than the incredible 11 year-old film wizard himself, ERIK!!! And the winner of the Can’t Sleep Without Sheep Kids’ Drawing Contest is his sister, the very talented JOSIE!!! congratulations to the winners… Cake! Yes definately cake time here… 🙂 Love your book you have chosen Susanna. Illustrations are beautiful and will be a great asset to the PPBF list. Wow! Congratulations to all the winners!! This is a big day! I sure enjoyed everybody's videos. This is a brave crowd! I also like your book for today. This is an important issue for kids to be aware of. And this looks like a fine book to share with a classroom. Thanks for sharing! The perfect book for this special day, Susanna! I will try to do a PPBF post, Susanna…busy Skyping with my AFCC panel mates in the UK and Singapore to prepare our presentations…truly mind-boggling and exciting! Oh, I meant to tell you. I am adding your link to the resource list my panel is making…and my discussion will be about the people, resources and blogs or websites that helped me (and would help any author blogger)…I will be talking about you and Julie Hedlund. 🙂 So take a bow, Susanna…much deserved! Congratulations to Erick and Josie!!! That is such exciting news. I love all the wonderful things you always have going on Susanna!